These DVD's made my son's yr. Excellent quality. Speedy delivery. Well worth the $. Needless to say I'm very pleased with this item. My 2 year old has recently gotten into the show Little Einstein but regular episodes just didn't last long enough especially when traveling. This three pack is jammed full of episodes and extras and keeps my little one entertained for any extended car ride we go on. In addition it introduces my little one to arts and music while remaining interesting. I am not tired of watching or listening to it yet and we've had it two weeks. All around good show for young people. It's really educational and helps children learn fast. My son suffers from a illness called Autism and from day one that he saw Little Einsteins he has always kept full attention on it and started to mimic and even repeating with the characters of the cartoon. I was so amazed by how fast my son started to learn the classic songs and even how he started to talk (Keep in mind that my son's first language is Spanish not English and he watches the show in English and knows each of the things that he learns from the program in both language)that me and my husband decided to start buying their DVD's and even some of the toys. 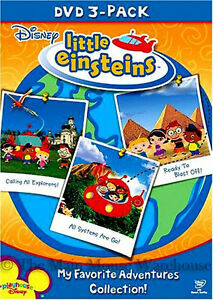 I like that Little Einsteins is interactive and entertaining to my son who just turned four yrs old. I love that he learns so much from the movies, it teaches about music and art, animals, and teaches about different parts of the world and cultures. He loves to sing along and play along with the movies and they make him very happy.